Planning permission and associated legislation can be the cause of many neighbour disputes, ill will and bad feeling if you’re not careful. What can make matters worse is when householders don’t know the regulations and start disputes based on incorrect assumptions and information. Fortunately, the rules regarding planning and building regulations for a fence are fairly straightforward. That said, take care and don’t assume anything when thinking of replacing a fence with another of a different style – or even the same style. Firstly, is the fence your responsibility? 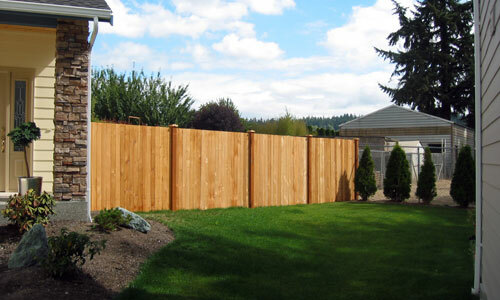 In adjacent properties there are often fences bordering each property. In other words, it could be anything in theory as there are no actual laws as to who owns or controls fences or what boundary you’re responsible for. The Land Registry possess details of land registered and the general boundaries. If the previous owners have worked out exact boundaries, then this will be recorded. You can obtain a title plan for your property. Check your deeds to see if there are any existing boundary agreements on your property. If not and you and your neighbour – or neighbours if both sides of your property need clarification – wish to you can draw up a boundary agreement with details of who is responsible for what boundary. Draw it up in writing and make sure you and your neighbours sign it, then submit it to Land Registry. If only you have signed it, Land Registry will check with your neighbours to ensure they agree with it. Details of the application process can be found here. If there is a dispute between you and your neighbours, then it can be referred to a tribunal. 1. It would be over 1 metre high and next to a highway used by vehicles – or the footpath of such a highway. 2. If it’s over 2 metres high in a different location. 3. Your house is a listed building or within the land boundary (‘curtilage’) of such a building. If the fence forms a boundary with a neighbouring listed building (or the land within its boundary as above). 4. You are under the control of an article 4 direction or a planning condition. Generally, changes to a property not covered by specific planning permission regulations fall under the general planning permission granted by Parliament. Sometimes, these permissions are removed or restricted by an article 4 direction. 5. If you’re intending to put up a fence where none presently exist. For example, in some cases front gardens are all open plan so erecting a fence would almost certainly need planning permission. They generally don’t apply to the type of fences under discussion here, but the general wording is that they should be ‘structurally sound’. You can take down a fence or alter it as long as you don’t increase its height. There may be an exception to this if you live in a conservation area. Check the government’s planning portal for more information. Even if you’re sure your new fence meets the terms as outlined above, it’s a good idea to check with your local planning department – and do make sure it’s your fence to change (if you’re replacing an existing one). It’s always preferable to communicate fully with your neighbours. After all, you or your fencing contractor may need to access their garden when putting up your new fence so the more you can do to foster harmony with those around you the better.